n Planet Defenders you are controlling 3 robots trying to defend 9 planets from malfunctioning robots. As the theme might lead you to believe, this isn’t a very serious game. But does it have enough interesting decisions to warrant a recommendation? What is Planet Defenders like? I got Planet Defenders all the way back at SPIEL‘16 and yet I just couldn’t get it to the table. I think the theme might have kept it from really going to the top of the want to play pile. But that is a shame, because this is actually a quite unique and interesting game. As previously mentioned, you control 3 robots – as in – everyone playing can control every robot. You don’t control a robot of your own. You control them by activating robot ‘control cards’. A control card is a card that allows you to move a specific robot in a specific way. There are always 3 cards available, but they are two sided, and every time you activate one you will flip it over revealing a different action for the next player to have available. You may activate the control cards up to two times on a turn (but not the same card twice). Activating a control card costs you battery cubes. The first activation costing 1 battery, and the next costing 2. Battery cubes are one of several resources in the game, the others are blue, yellow or green energy cubes. 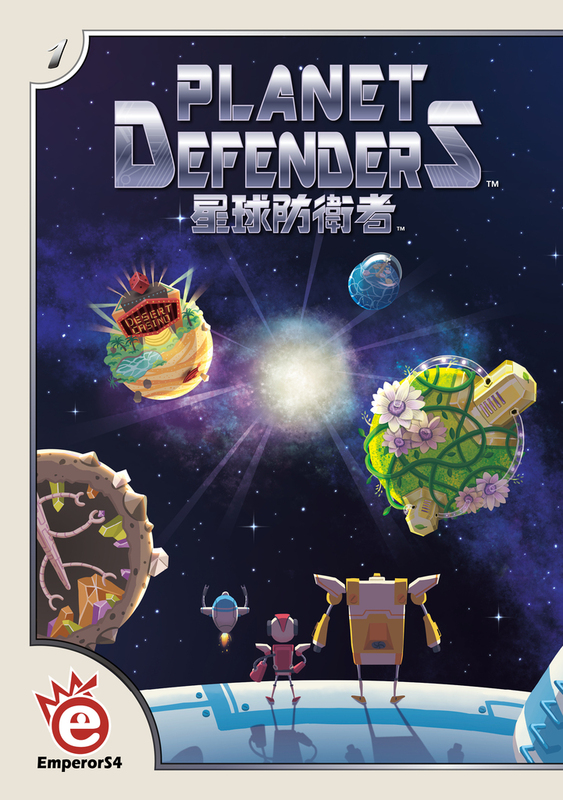 The object of the Planet Defenders is to capture the evil robots that are ‘attacking’ the planets. The planets are placed in a 3×3 grid. On each side of the grid, one of these robots is available for capturing. To capture a robot you need to have enough energy cubes of a specific kind for each robot. The robots are worth different amount of robot points. If you have captured the robots worth the most robot points at the end of the game, you win. In many ways this is a resource management puzzle. You spend batteries to move around on the planets in the grid. The planets have different rewards for landing on them. Some give you a lot of battery cubes, while others give you a lot of energy cubes of a specific colour, and yets others will let you exchange resources for different resources. So what you do in the game is maneuvering the defender robots around and generating energy from the planets, trying to get enough to capture the robot you are going for right now while also making sure that you keep your supply of batteries at a good level so you can take two actions each turn. The strategy comes from deducing what robots you can get before your opponents and seeing the optimal path for that. But the game is mainly a tactical exercise. Reacting to the board state the previous player left you. Besides from capturing robots, the energy you collect can also be used for getting technology cards. These will give you various powers that let you bend the rules of the game, moving further, getting more energy for an action, or paying less for things. As previously alluded to, the theme of this game could be many things. It is quite abstract and frankly didn’t catch me. The artwork is whimsical and did make me want to play the game once I got it to the table. But when I played the game I really had a lot of fun with the it. The tactical nature of play might turn some people away, but with the right group and mindset the chaos led to a lot of fun oh-no-I-needed-to-do-that moments. So as a gamers game it get a 3/6. But as a family game it might even get a 5/6. 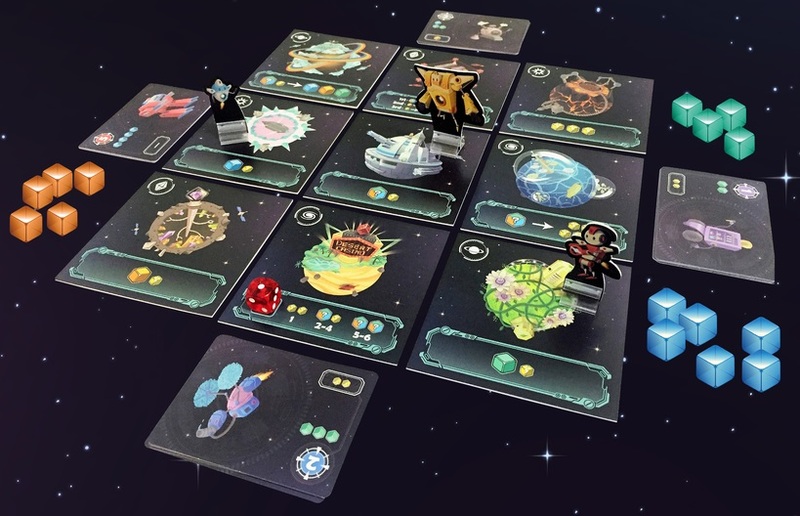 For me though, it had enough fun to be a decent (but a little long) filler or starter for a game night – but the lack of thematic integration kept if from really shining. I really think this will hit the right spot for families both thematic and gameplay wise. Quite simple rules. I would say about the same level as Catan. The rulebook of the version I played could be a bit clearer in some places. This review is of the first edition of the game. There might be changes to the rules, clarifications and changes in production in the newer version from Renegade Games.